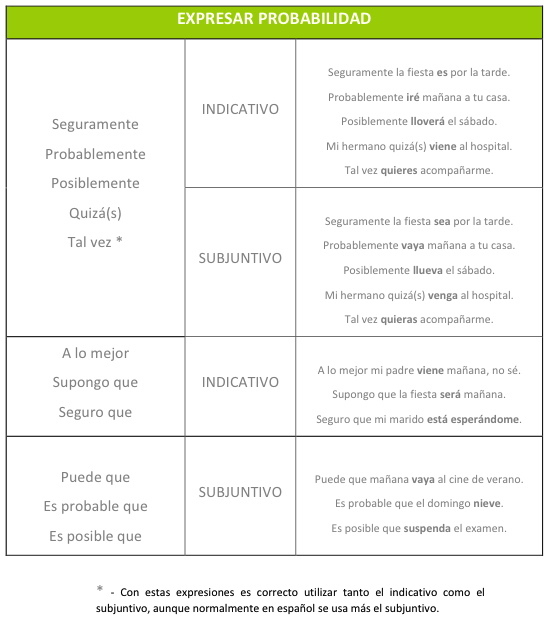 As you can see on the chart above, in Spanish we often use the subjunctive mood when we use “seguramente”, “probablemente”, “posiblemente”, “tal vez” and “quizá(s)”, as they involve situations that are possible or likely but not definite. However, we can also use them with the indicative (non subjunctive). The reason why we sometimes see the subjunctive used and sometimes not is all to do with the true meaning of the sentence: the subjunctive is used to show uncertainty or possibility whereas the indicative is used to convey certainty. Quizás tus padres no vengan hoy a casa (Perhaps your parents aren’t coming over today). Tal vez vayamos de vacaciones en julio (Perhaps we’ll go on holiday in July). A lo mejor voy al centro esta tarde (I might go to the town centre this afternoon). Puede que debas buscar otro trabajo (Maybe you should look for another job). Posiblemente sea culpa mía (It might be my fault). Seguramente iremos a Sevilla en agosto (We’ll probably go to Seville in August). Es probable que Carmen se tiña el pelo (Carmen is likely to change her hair color). Probablemente vaya a su boda el sábado (I’ll probably go to her wedding on Saturday). Supongo que tu hermano estará enfadado conmigo (I suppose that your brother is mad at me). Seguro que mañana viene Pedro (It’s (quite) sure that Pedro is coming tomorrow). 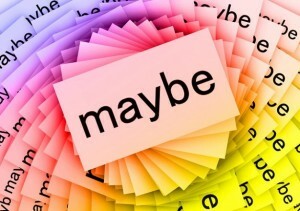 If after reading this post, you keep having trouble with these expressions, go ahead and ask us for a free trial class. We’ll help you!